Several thousand protesters took to the streets across Brazil on Sunday on the 55th anniversary of a coup that established more than two decades of military rule. Demonstrators chanted "dictatorship never again" and slogans against President Jair Bolsonaro, who ordered the date be commemorated. 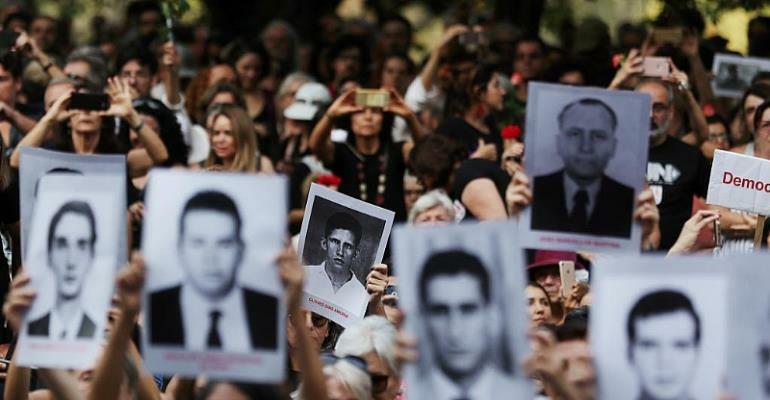 Some 2,000 people rallied in Rio de Janeiro's central Cinelandia plaza, while in Sao Paulo a few hundred converged on popular Ibirapuera Park to demonstrate against the 1964-1985 dictatorship. The protests were sparked by the order recently issued by far-right President Jair Bolsonaro for defence forces to commemorate "appropriately" the overthrow of President Joao Goulart. Nearly 1,000 noisy protesters in Brasilia chanted slogans against Bolsonaro, an ex-army captain and unabashed admirer of the country´s former dictators, shouting "Bolsonaro out." The demonstrations came a day after an appeals court judge overturned another judge´s decision to bar commemorations sought by Bolsonaro. Appellate judge Maria do Carmo Cardoso accepted the government's argument that Brazilian democracy was strong enough to support "a pluralism of ideas." Bolsonaro, who is on a three-day visit to Israel, is the country's first president since democracy was restored in 1985 to publicly exalt the military regime, though he argues its rise to power was not a "coup." Since taking office, Bolsonaro has had fond words for military dictators in 1970s and 1980s Latin America, such as Alfredo Stroessner of Paraguay and Chile's Augusto Pinochet. At least 434 people were killed or disappeared in Brazil during the 21-year dictatorship, far fewer than the 30,000 deaths in Argentina and 3,200 or more in Chile during their respective periods of right-wing military rule. But unlike its South American neighbours, Brazil has not prosecuted military officials for regime-era crimes, leaving the events of that dark period unresolved.